For years, former Major League Baseball pitching coach Tom House researched and tested the use of weighted balls to create faster arm speed and throwing velocity. 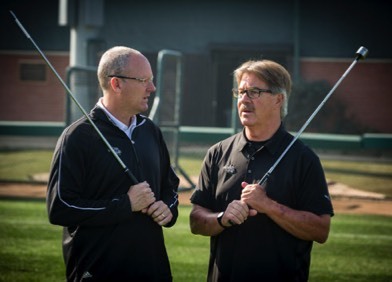 After seeing tremendous results in the baseball players and football players he worked with, House and his business partner Charlie Nootbaar were convinced that they could apply the same principles to the golf swing. They designed a set of weighted clubs, tested them with the Titleist Performance Institute (TPI) and witnessed amazing results. While the weighted shafts were definitely a key component, House and Nootbaar determined that the most compelling factor behind these great results was their focus on the unique needs of rotational athletes. What Is a Rotational Athlete? During the course of play, anyone who rotates their shoulders separately from their hips is considered a "rotational athlete". The most common of these are golfers, baseball players (both hitters and pitchers), football quarterbacks, and tennis players - basically any athlete that swings or throws something. Today most current athletic training focuses on exercises that work in the frontal or sagittal plane. While this is good for general conditioning, it is not cross-specific for rotational athletes who mostly rotate in the transverse plane. 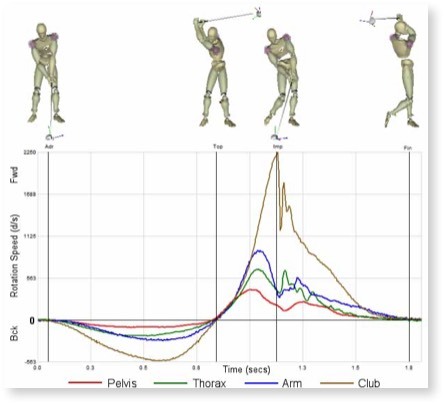 So as the RDRBI researched better conditioning protocols for transverse plane movements, they found that these improvements directly correlated to golf performance as well. More specifically, the Velocity Shafts™ were adding distance to drives and irons without the need to "swing harder". Dr. Tom House, the Director of RDRBI and an Advisory Board Member at TPI collaborated with Dr. Greg Rose, Founder and Director at TPI, on the conditioning protocols and the results validated at TPI’s facilities were amazing! As you can imagine, there is a lot of science behind the research, but we'll leave the technical stuff to the guys in the white coats. Our aim here is to simply help golfers get more yardage from their swings by using the Velocity Shaft™. In order to maximize swing efficiency and ball flight distance in golf, the study and understanding of Kinematic Sequencing is vital. In the golf swing, the upper body (shoulders) rotates during the backstroke while the hips stay relatively stable. But as the forward swing begins, the hips actually activate this forward rotation. Once the hips reach peak rotational velocity, the energy is transferred to the shoulders. The shoulders then accelerate to peak rotational velocity, at which point the energy is further transferred to the arms, and then the club. If this "chain" of events is not sequenced properly then energy is lost. The VELOCITY SHAFT™ was designed to maximize this sequencing and allow more rotational energy to be sent to the ball.